To just change the text you can use a function. It is a good idea to create a child theme of Twenty Eleven first so that you can use automatic updates without losing your work (there are instructions on how to create a Child Theme on the WordPress codex). In reply to: Congratulations Stephen Edgar! Does it work if you use a default theme (e.g. twenty twelve)? You can choose the order than forums appear in by giving them an Order value. I usually give mine order values like 10, 20, 30, 40 so that if I add another forum later I don’t have to reorder them I can just add order 25 to put it in between 2 existing forums. I don’t think there’s an easy way to have forums change order by activity but if activity is important to you then you should consider having Latest Topics as your default view instead of categories (like https://bbpress.org/forums/). You can allow them to use images hosted elsewhere via HTML or BBCode. e.g. Or there are plugins (GD bbPress Attachments) to add a way for them to upload an image on your site. There isn’t currently a plugin, I think, that will let them upload an image and place it somewhere the way you do with a WordPress Post using the Media Library but it’s on the roadmap for the rtMedia plugin. I can see all your pages fine, if you log out can you see them? Or is it working now? There is a bug in 2.4 causing this (https://bbpress.trac.wordpress.org/ticket/2405), it’s been fixed for patch 2.4.1 but this hasn’t been released yet. The bug did not exist in earlier versions, hence it works on one for you but not the other. If you need it urgently you could apply the patch in the trac item yourself. But it would have to have 10 replies before the pagination would appear…or do you mean you have set the ‘Topics and Replies Per Page’ limit to less than 2? The nested replies limit only does how many levels deep the conversation can go, it doesn’t affect pagination. Sorry if I’m not understanding your question :S Maybe add some screenshots of the settings and of the results you get (you can share them using http://imgur.com). I think it works like this: If nested is enabled, it will show 10 parent replies, it won’t count the second level nested replies in the 10 (because that would break a discussion over multiple pages). Does that help at all? content.php seems like a weird place to be swapping an image, is this a header image or something? From the way you’ve worded it I think maybe you need an if else statement around the specific image? Is that the issue? If not, could you describe a bit more what you’re expecting to happen and what is happening instead please? It could also be that you actually need a BuddyPress if call rather than bb. Perhaps try patching with the change (https://bbpress.trac.wordpress.org/changeset/5109) and see if it works. In reply to: Reply Threading not working? You’d need to ask the Genesis folks about bbPress compatibility 🙂 Are you using https://wordpress.org/plugins/bbpress-genesis-extend/ ? No idea if it’d help though. Pick the template you want to use and make a copy of it called bbpress.php (in your child theme folder) and bbPress will figure out the rest. Your child theme needs to call your normal WordPress theme as its parent. It will then use your normal theme and add your child theme customisations on top. If you have followed the instructions there, especially Step 5 (including the bit where it tells you to follow the ones here: https://codex.wordpress.org/Child_Themes) then activating the theme should still use your normal theme as well. Acutally it’s probably not that, what theme are you using and does it still happen if you use a default theme like 2012? What are your WordPress permalink settings? There is no simple way of doing this, the breadcrumb uses the automatic Forum Index. Why do you need to use a page? Perhaps there’s a different way of looking at it. 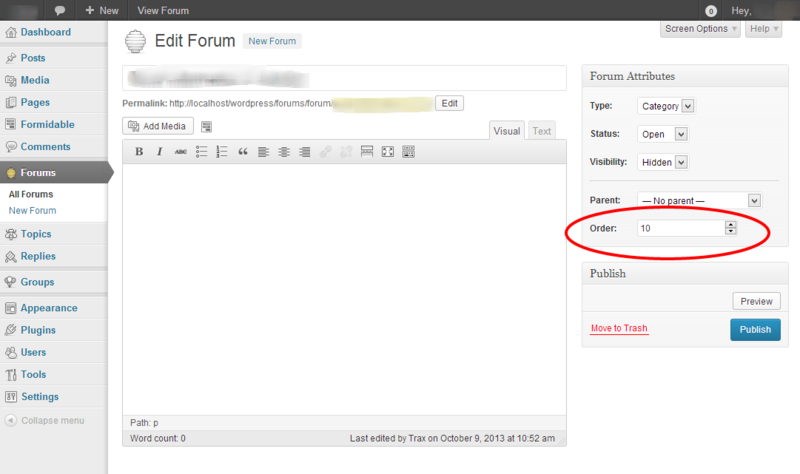 The breadcrumb uses the default Forum Index even if you use a shortcode to display your forum so it will always link back to the automatically created Forum Index. If you only need the shortcode method because of the template problem then let’s fix the template so you don’t need the shortcode. I’m guessing your theme doesn’t have one of those so bbPress appears to be using some kind of archive template. You need to give bbPress a theme template to hook into. In your theme folder (or in a child theme if you want to do auto-updates with your theme) create a bbpress.php template, you can probably just create a duplicate of one of your theme templates and change its name. Here’s my bbpress.php template: http://pastebin.com/ZquKQfmw (Adept is my theme name, hence @package Adept). I took my theme’s full width template and duplicated it, called it bbpress.php then changed the header information. bbPress will figure out the rest. What versions are you running? Pretty sure this got fixed in 2.4. In reply to: what are the benefits of Genesis layout extras ? This is a question for the creators of the plugin. The plugin page has lots of information https://wordpress.org/plugins/genesis-layout-extras/ and also links to their support forum if you have further questions. It is best not to make changes to the bbPress core files because they will be lost when you update. The same for your theme files unless it’s already a custom theme. The best way is with a Child Theme. The last rule defined overrides any previous, conflicting rules so this file will make your styles the last rules. See if it works then and if it still doesn’t then check for what is overwriting it – because something is. Something like https://wordpress.org/plugins/members/ or https://wordpress.org/plugins/s2member/ might do what you want but there are lots of different WordPress plugins for this, just check for one that is recently updated and compatible with bbpress.